Santa Fe, NM, March 05, 2019 --(PR.com)-- High 5 Edibles of Santa Fe, NM has achieved a first for the global cannabis vertical. 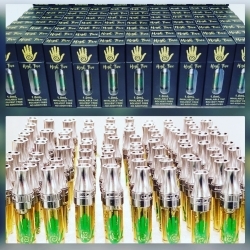 Utilizing a close working relationship with Fruit of the Earth Organics Dispensary in Santa Fe, NM and the Organic Alcohol Company of Ashland Oregon, High 5 Edibles has created the first craft cartridges with specialty 190 proof organic alcohol made from Lychee nuts. The organic alcohol company produced a limited supply of the only organic 190 proof alcohol made from lychee nuts. The unique solvent lent itself brilliantly to the extraction process. The plant material strain named 24k gold was provided by Fruit of the Earth Organics for the experiment. Brianna had hoped that the name would be a prelude, the clarity and purity that she has seen from truly high end material. As the team stated, "Our power protocol is only limited by the material. If you don’t start with quality, it’s just an uphill battle to get an attractive product without scrubs or clay." The testing and corroboration of the experiment was provided by New Mexico Premier state approved testing lab, Rio Grande analytics. The facility was blessed with a soft sweet scent from the solvent as opposed to the somewhat acrid nature of ethanol. During refinement, they experienced the same soft scent in the lab; but were astounded by the clarity achieved without any scrubs or clays on the first and only pass. The idea, originally formulated by Brianna Oxhandler, CEO of High 5 and Seth Oxhandler, CSO of High 5, and Bobby Townsend, VP of the Organic Alcohol Company, was to impart organic, natural terpenes to distillate through the extraction process. The trio established the SOP for the process that was carried out by Seth Oxhandler and Aiden Luna with over sight by Brianna Oxhandler. The success of this experiment can be found at the counter of Fruit of the Earth Organics, in Santa Fe, NM. This one-of-a-kind application of imparting terpenes through the extraction process has yielded an inhalable product that is unparalleled. The light sweet hint of lychee is absolutely astounding. This process establishes the infusion of flavor at the beginning of the process and is carried through to the end product. As where most manufacturers are adding them afterwards, High 5 has proven again that beginning-to-end thinking produces a unique and superior all organic product with patient health as the first and foremost focus. Click here to view the list of recent Press Releases from High 5 Inc.